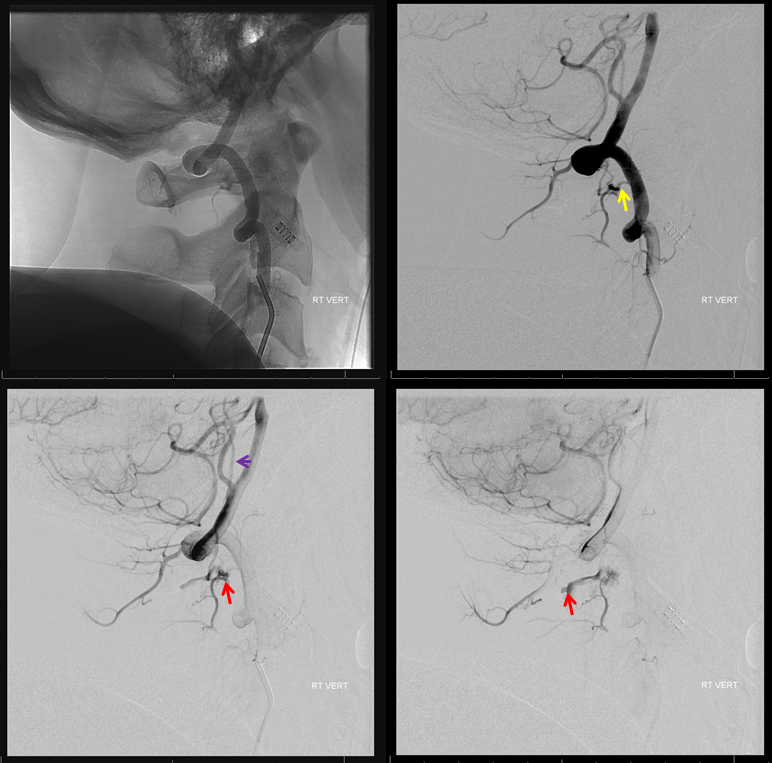 A stronger and longer injection better demonstrates cranial venous drainage into the anterior premedullary vein (pink) and onto the prepontine vein (green). 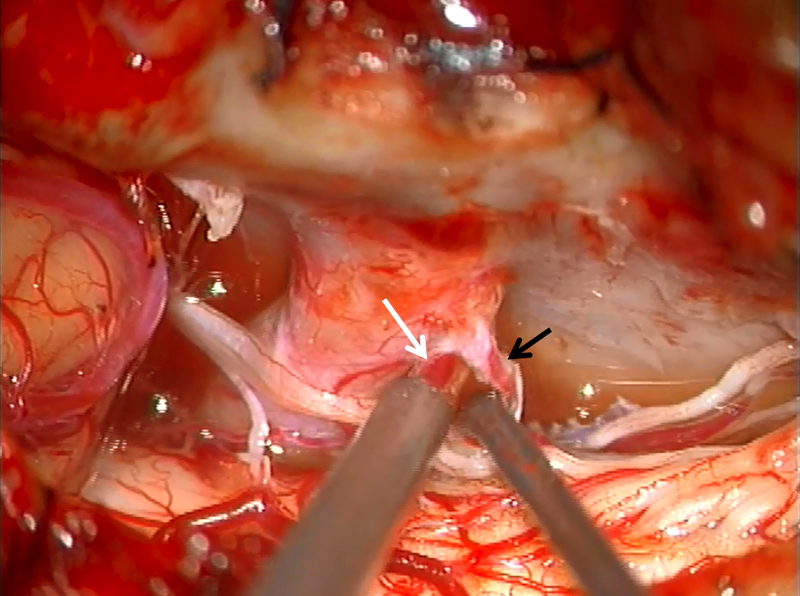 Lateral pontine vein (yellow) ultimately drains towards the jugular bulb. The pontomedullary sulcus is shown by white arrow. C2 muscular branch is still brown. 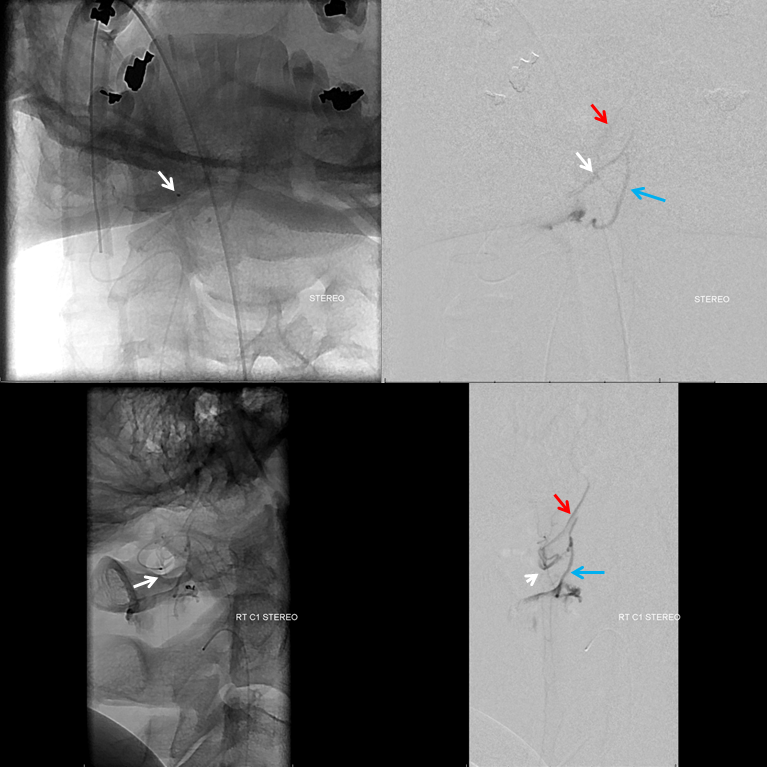 We managed to perch the microcatheter (tip white arrow) in the tiny C1 branch ostium to get a picture. The descending C2 vein is blue. Reflux into the vert is red. Needless to say we did not feel too good about this embolizaiton position. 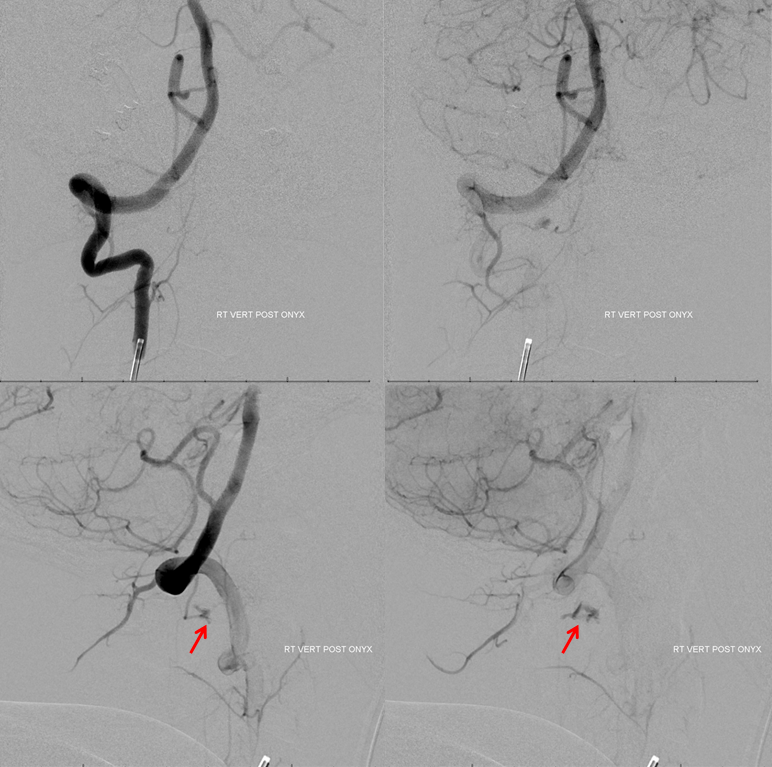 We were also somewhat concerned about C1 level embolization because of the lateral spinal artery. It is never too far from this branch, and we turned out to be right. So, we decided to close the residual fistula surgically. We have the benefit of a hybrid Zeego room, which is key for small vessels like this one. C-arm is generally not enough. A post-embo CT shows Onyx in the C2 radicular branch. 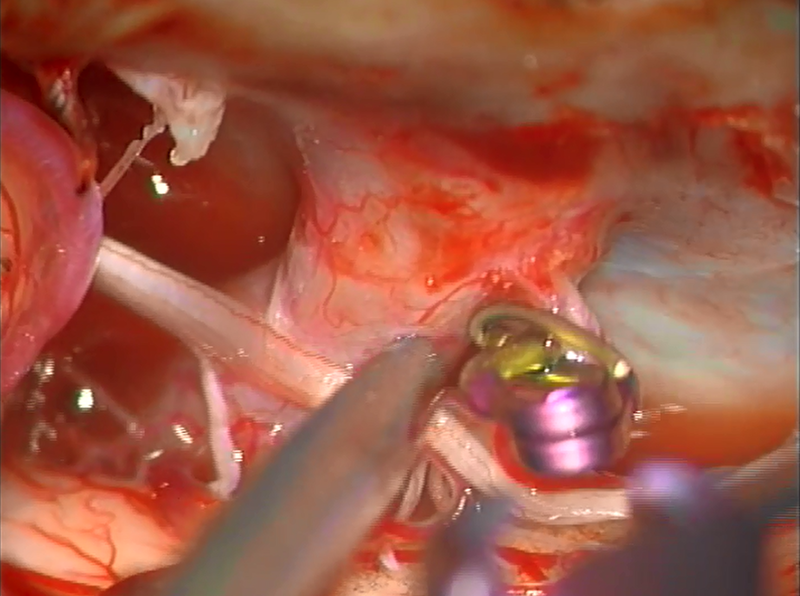 A beatiful intraoperative view, from posterior and right lateral. 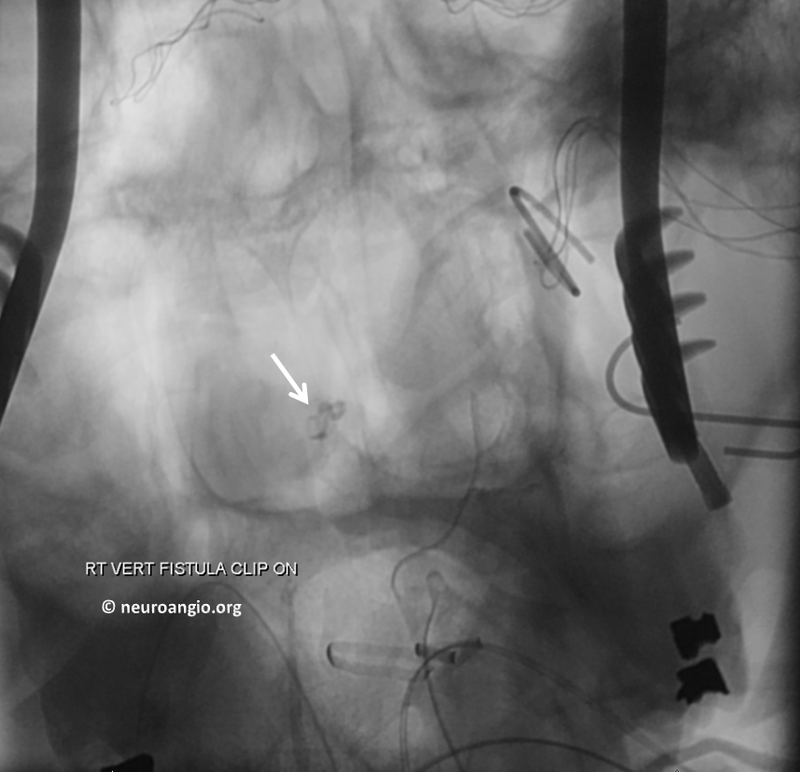 The very proximal intradural vert. 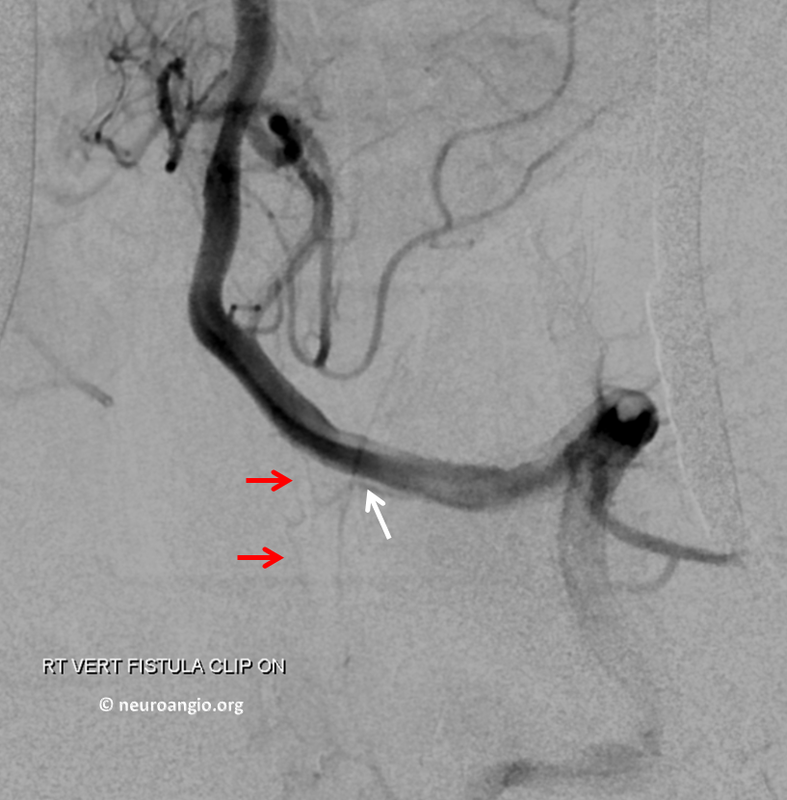 Inferior to it are two vessels — one is the arterialized C1 radicular vein which is draining the fistula. 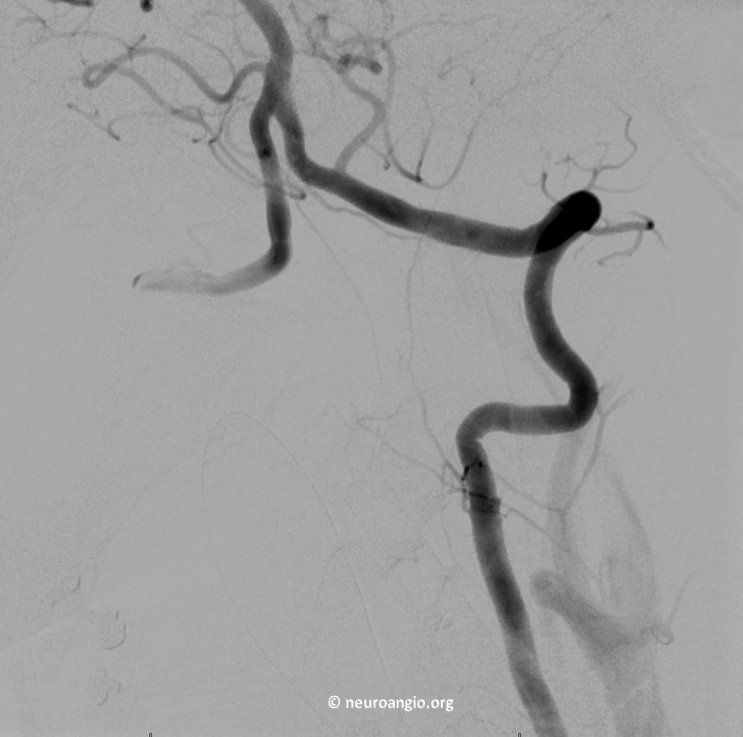 However there is also another, which was not seen on the angiogram. 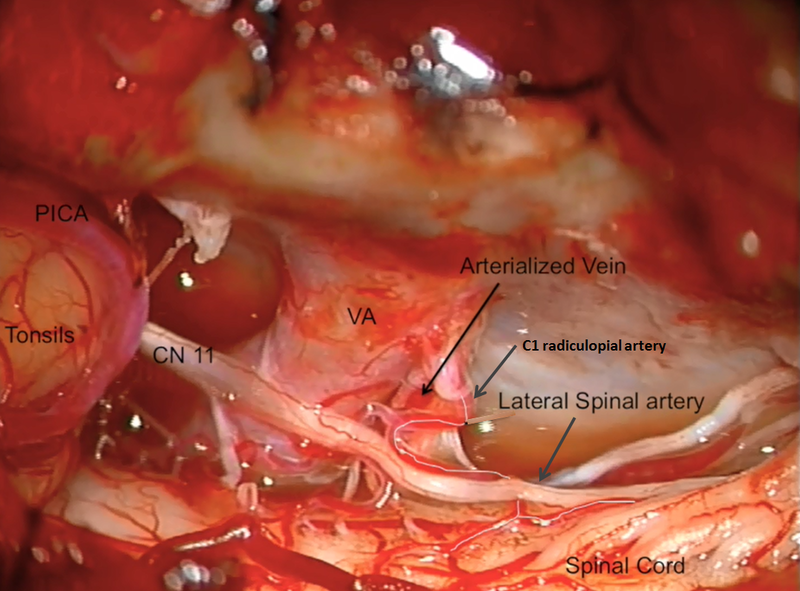 It is our friendly C1 radiculopial artery supplying the lateral spinal artery. In most cases the whole thing would be named “lateral spinal” or posterior spinal, but technically the branch along the C1 nerve root which supplies the lateral spinal is the radiculopial branch. Either way, this picture shows why it is usually not a good idea to push Onyx or glue into the C1 radicular branch. 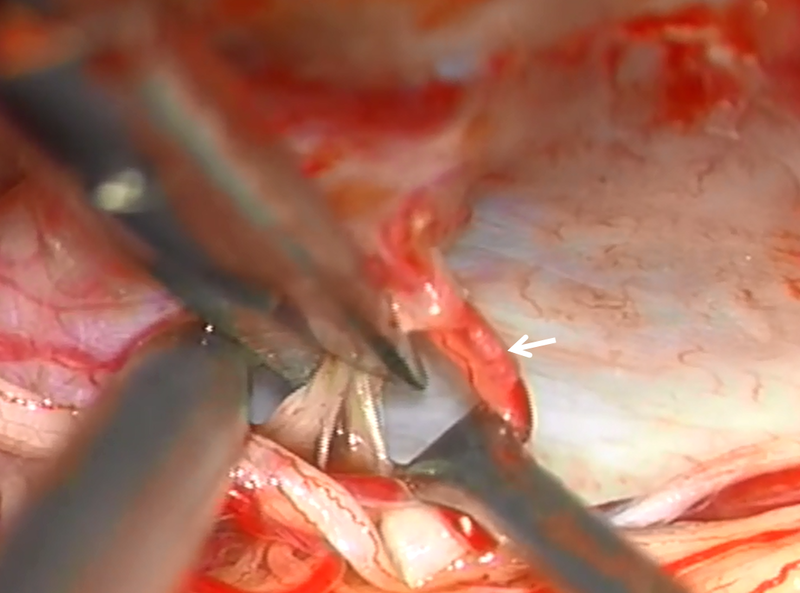 A temporary clip is placed on the draining vein. The fistula is gone. But there is more. 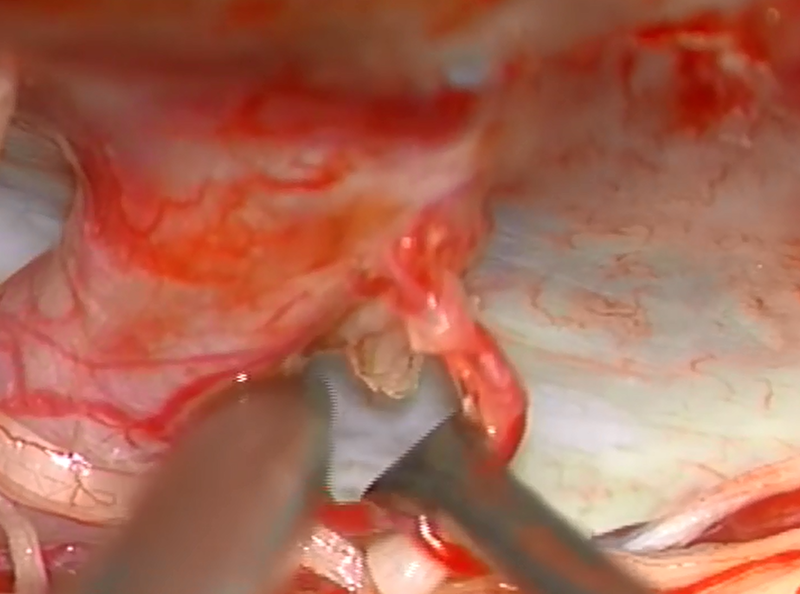 Now we see the radiculopial (white) and lateral spinal (red) arteries! Why? Probably because dissection and retraction of neck tissues allowed for better visualization. I do not think it is because of steal or competitive flow related to the fistula. For once, there is no reason to believe the body can’t supply both. Also, the lateral spinal did not look too starved under the microscope. 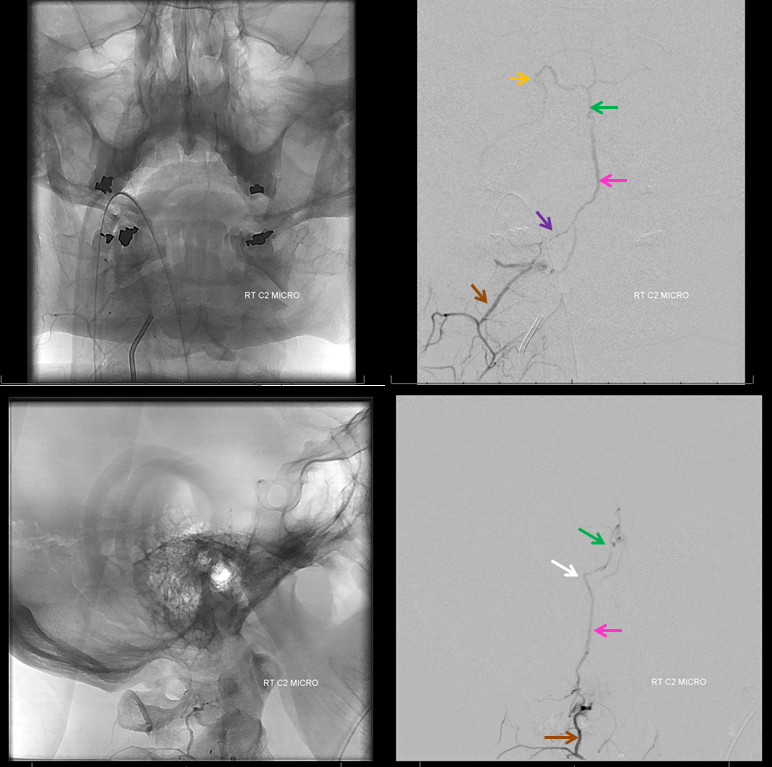 Finally, the patient never had any clinical signs of lateral cord ischemia. 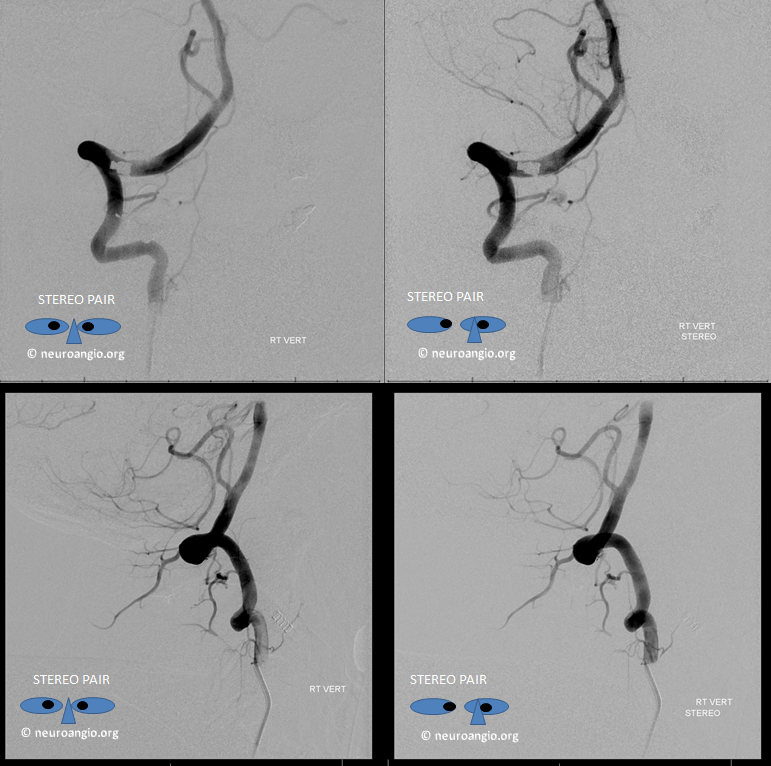 But it is an angiographic correlate of what is seen surgically. Had we embolized from C1 position a lateral cord syndrome would likely have resulted. 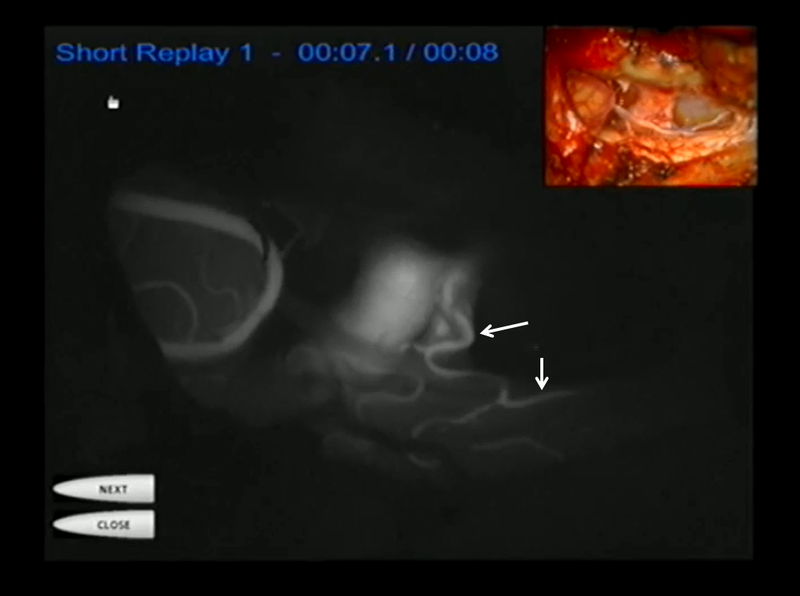 So, how do you do a prone intraoperative vertebral injection? One way is to put a long sheath into the femoral artery and bring it to the lateral aspect of the leg. But a much easier way is to go radial. 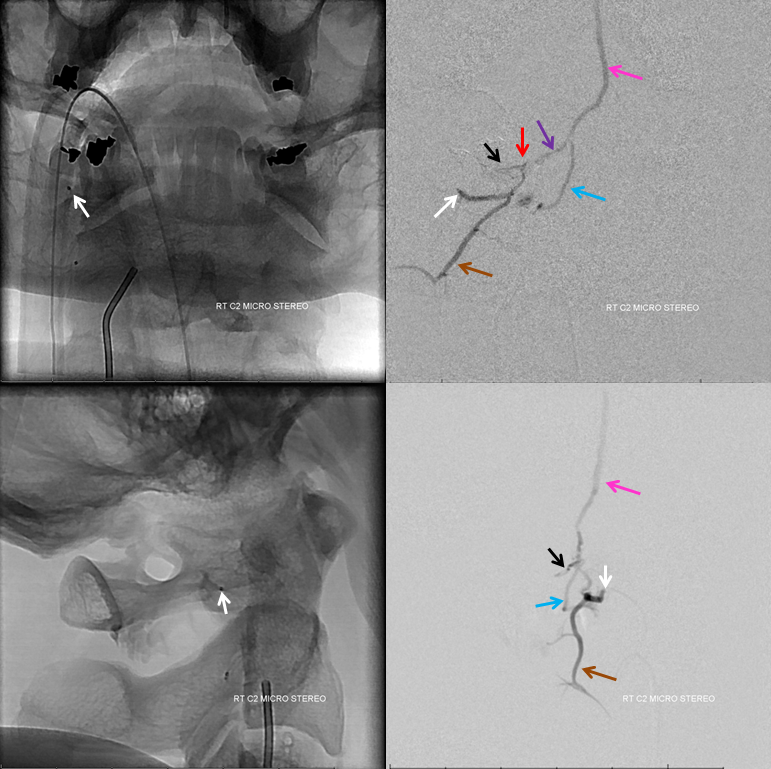 In fact, all of this patients angiograms were done through the right radial approach. No femoral access ever. Much more convenient to do this in prone position. 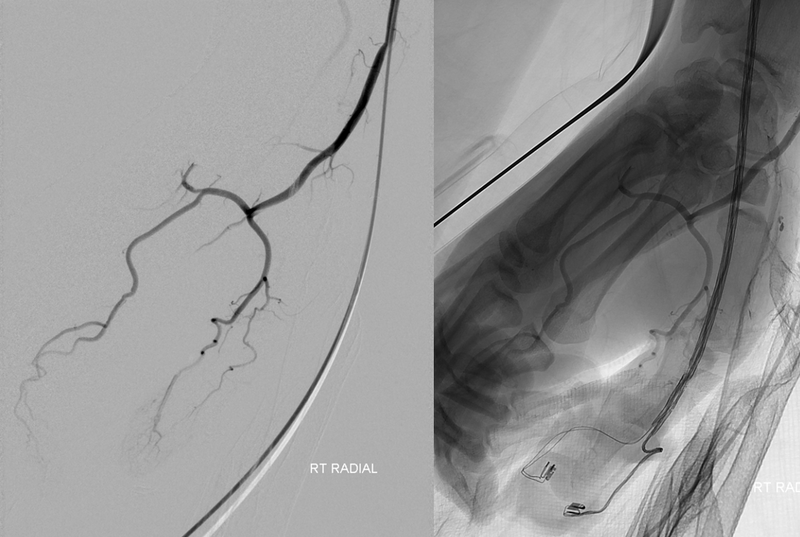 Conclusion: This is a case of small and perhaps complicated vessel anatomy in a critical location. 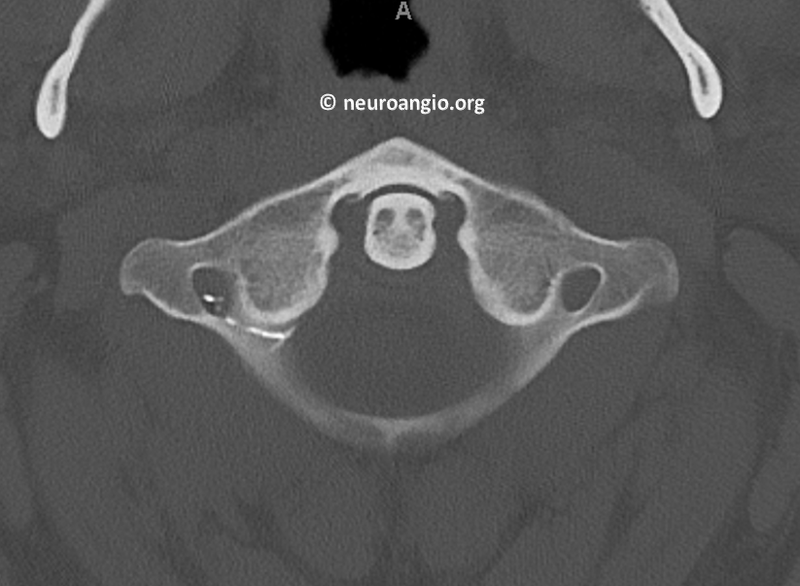 They may not look very dangerous, but C1 and C2 branches are very treacherous because critical spinal arteries are never too far and lateral medullary and lateral spinal syndromes are some of the most frustrating deficits patients face in terms of persistent sensory disturbances. So, be careful.